Trainz.com Blog: 2 Truckloads of Trains! 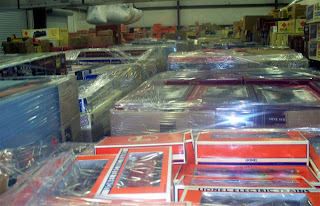 We just received in 45 pallets full of Lionel, K-Line, Aristo-Craft, LGB, and Marklin trains. These have come from the remaining inventory of long-time distributor Trost-Hobbycraft based out of Chicago. We started adding them to our website and listing them on eBay the week of March 25th. We have thousands of brand new items from Z to G, many of them several years old and never sold to a dealer or individual. Keep an eye on both our website and our eBay listings for an outstanding variety of trains at great prices. Here is a photo of one of our warehouses and what we are working through.